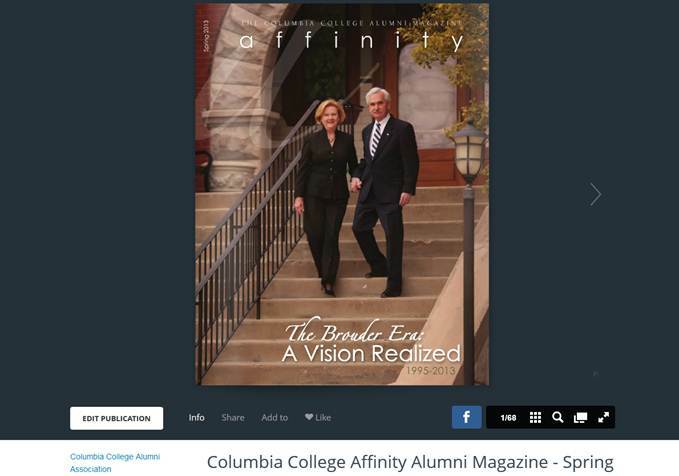 affinity Magazine now available in digital format! Columbia College's alumni magazine, affinity, is published three times a year and beautifully printed by the Office of Alumni Relations. It's also been available by PDF, but for those wanting an eco-friendly version that feels more like flipping through a magazine, affinity is now available in digital format using Issuu. Be sure to flip through the latest edition of affinity today using this amazing digital reader! And to stay up-to-date on all alumni events and news, check out the Alumni Relations homepage regularly. Tuesday, September 03, 2013 Chk out- affinity Magazine now available in digital format!